Inspiring Art Teachers to Explore Art History | Curator’s Corner: Another Vanishing Tradition? What do we in the West think of when the word “African art” is mentioned? masks? ancestor figures? In most African cultures, textile arts are considered THE finest of the fine arts. In pre-colonial times, standard widths of cloth were used like money in many regions of Africa. A regular number of standard units were required to make a woman’s wrap and thus served as a unit of value. Today, the myriad patterns seen in woven, resist-dyed, tie-dyed, and painted textiles of numerous African cultures are popular throughout the world. The textile art tradition of Nigeria, and other African textile centers such as Sierra Leone, is so rich and multi-faceted it deserves to be my “holy cow!” moment of the week. The wax-resist process of decorating cloth is an ancient art form. Textiles were decorated with wax-resist technique certainly as far back as Ancient Egypt. The technique flourished throughout Asia, flowering in Southeast Asia (where it is called “batik”), especially in Indonesia, which is perhaps best known for “batik” fabrics. The process came to Africa in the nineteenth century via Dutch traders. Africans traditionally loved colorful fabrics and the process was adapted, customizing it with designs and colors that reflected local traditional culture. The basic process for wax-resist printing is to paint or stamp a design or pattern in molten wax on a length of fabric. When the fabric is dyed, the wax resists the dye and forms the pattern. The wax is then removed in boiling water. One of the most treasured aspects of wax-resist is the “cracks” patterns that occur due to the fact that the wax cracks while the fabric is being dyed and the dye seeps through the cracks onto the cloth. In West Africa, indigo, mud and kola nut dyes are very popular. In Nigeria, wooden or calabash stamps are often used to stamp the molten wax onto the cloth. Nigeria currently holds 63 percent of West African textile manufacturing. Nigerian wax-resist textiles are found in almost every marketplace in sub-Saharan Africa. African wax-resist designs fall into several categories: women’s lives, town life and its effects, nature, and rhythm (music and drumming). 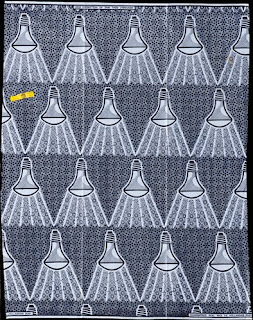 This bolt of cloth displaying light bulbs would fall under the “town life” category. 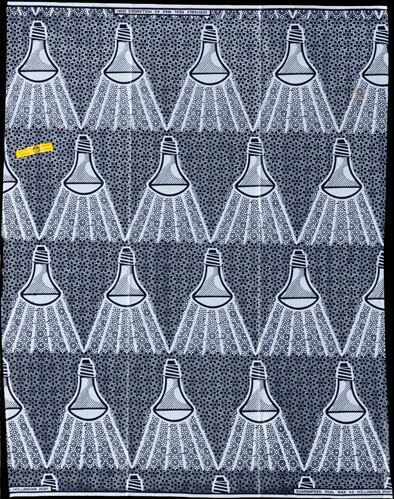 Interestingly, in the last five years there has been a major effort in Nigeria to make that country more energy efficient through the use of energy-saving light bulbs.